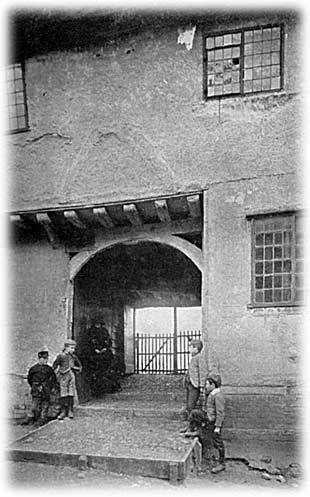 For many parishioners the way to church was through this gateway of the Guildhall, though perhaps the lads in this photo (probably late 19th century) have more mischievous plans for their day than listening to a sermon. The Guildhall, Grade I listed, dates from the late 15th century. 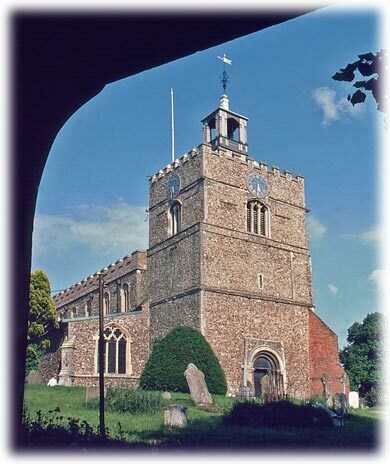 After the Reformation the building fell into disrepair until it was bought and repaired by Robert Kempe in the 1620s. 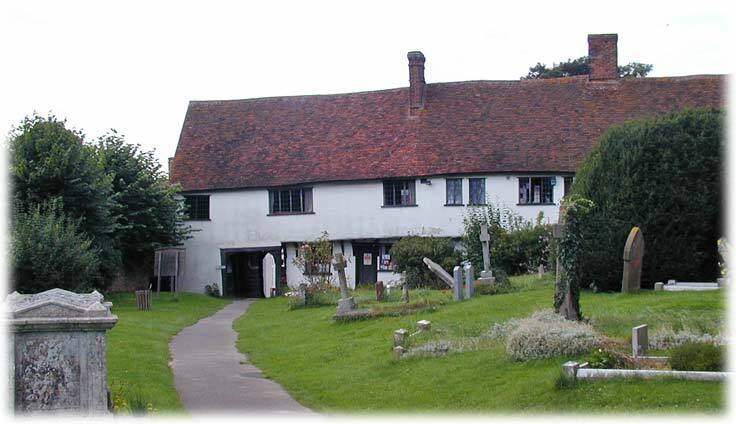 In 1630, he sold it to the village for £50 to be used as a school or almshouses. It has remained in village ownership ever since. The building is currently undergoing restoration and progress and more of its history can be seen on the Guildhall website (click here). This view of the Church of Saint John the Baptist is what you see having passed through the Guildhall. 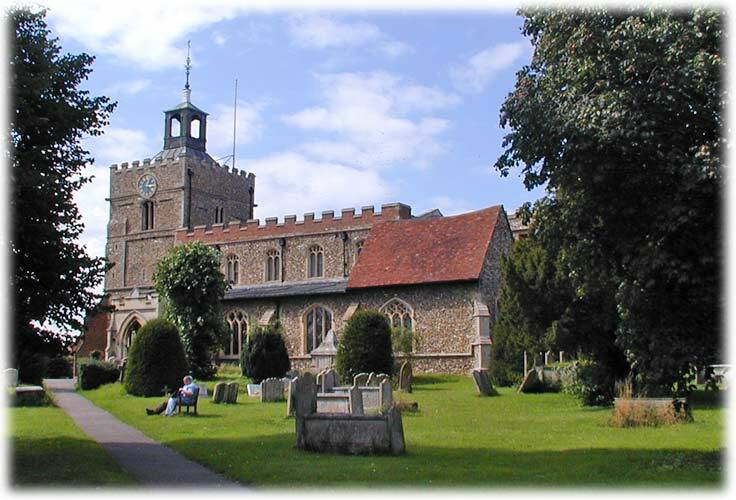 The church largely dates from the 14th century, though the lower two stages of the tower were built in the 12th and the third in the 15th. Perhaps, given the dominant location of the building, the tower was used for both defensive purposes and for worship. There was once a spire but it was blown down during a gale in 1658 and never rebuilt. All that survives of it is the 15th century angelus bell, which is now in the cupola built in place of the spire atop the tower. The South Porch, built in 1865 in early Perpendicular style, probably replaces an earlier porch of similar size. The ring of eight bells was installed in 1781, though one of them is older, dated 1766, but recast in 1952. The clock, of 1902, marks the coronation of King Edward VII. 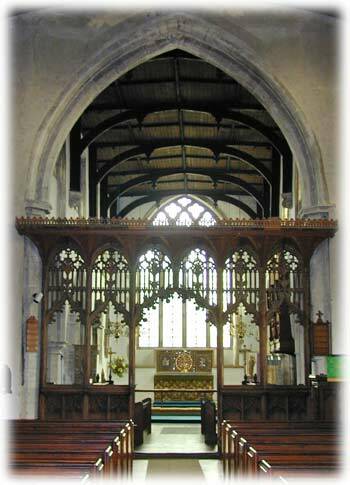 The Rood Screen dates from the early 15th century. Another screeen, leading into the Berners Chapel on the south side of the church, is earlier, c.1350. The colour photos on this page were taken in August 2002. Finally, the view of the Guildhall that parishioners through the centuries have seen as they left church.